Part 3 of the Things Fall Apart series... I've been sidelined for the past few days by a flu - my body perhaps taking too literally the theme of this series, hence I'll extend my admittedly arbitrary week schedule, reorder things and take a brief detour to ponder some photos. Hopefully you won't detect fevered intensity in this and later writings. Today is Ghana's 49th Independence Day, an occasion to look back in history in order to look forward. 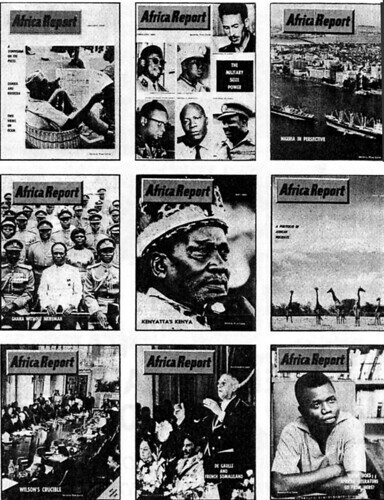 I've been thinking however not about the halcycon days of 1957, the celebrations, the happy shrugging-off of the colonial mantle, but rather about the year 1966, prompted by finally being able to obtain a copy of Africa Report magazine from that year. I scanned and uploaded a few of the photos along with some of the articles therein. Why 1966? I was asked. It was a significant year for Ghana but more generally, 40 years ago was "when West Africa lost its innocence", as a good friend put it. The military coups in Ghana and Nigeria were a major reason for this assessment; Ghana being the first country in sub-saharan Africa to gain independence and Nigeria being the largest on the continent and casting a large shadow. Thus there is a sense of wistfulness about the path of the continent, promise gone wrong barely a decade after the initial excitement and optimism of independence. To add more context for the Nigerian case, 50 years ago, 1956, was when oil was discovered in the Niger River Delta - perhaps a clue to part of the reason for the subsequent unravelling but that is getting ahead of ourselves. The image is at once iconic and, if you consider what happened months later, ironic. It features the President-for-Life, Kwame Nkrumah posing surrounded by army officers some of whom would shortly overthrow him. Is the fact that they are looking over his shoulder a foreshadowing of the long arm of the military in African affairs? Should one read ominous portents as the magazine's editors undoubtedly intended with its selection? The president looks confident in white with his ceremonial whip in hand, as well he should. At that point he was in full bloom, the one-party state enshrined in the constitution, titles and honorifics proliferating - Osagyefo, he appears secure in his power, surrounded by the obsequious and the sycophants. Everyone is smiling. One wonders who that woman behind him is (the one on the right) and where she ranks in the hierarchy. And those black shades! Now I suppose I shouldn't besmirch the legacy of a great man and erstwhile icon of pan-Africanism, black pride and the rest of it. It was said that the impact of seeing his triumphal trip to the United States and the image of John F. Kennedy holding up an umbrella to welcome him and feting him as he came to address the United Nations was to break a psychological barrier. Those countries that were perhaps hesitant about demanding independence could no longer wait. Sekou Touré of Guinea was one who succumbed to the irresistible glamour of it all. But still it is hard to bear the diversions into scientific socialism, the dissipation of the pan-African idea into overblown rhetoric, the sheer waste in other words... In Ghana, the popular overthrow of a regime that had started with much promise was perhaps a metaphor for the continent as a whole. The Winter of Discontent by Irving Markovitz - an article long referenced in CIA world factbook reports in years to come - but actually an article that is very difficult to obtain for some reason. These articles are obviously products of their time, let's start with the title of the first: Winter of Discontent. When was the last time there was a winter in West Africa? But that is nothing new, metaphorical excess is the rule in writing about Africa. Heart of Darkness ruled the roost long before Things Fall Apart came along. 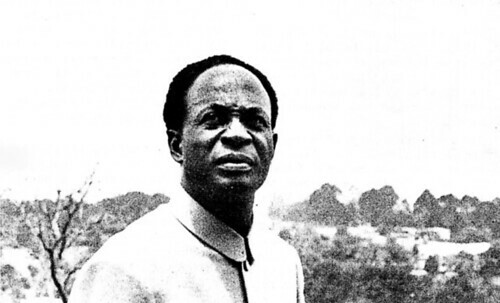 Markovitz posited that Nkrumah's choices for Ghana ranged from "Chinese communalization to Moshavism or laissez-faire capitalism". When was the last time you heard about Moshavism? 1966, we must then remember, was the height of the Cold War; the great elephants, East and West, fighting for world dominance and using the rest of the world as their battlegrounds. It is hard to believe the mindset and rhetoric of that era but perhaps our own era has its own tropes. As it was, regardless of the choices made by governments in Africa, in many countries the military stepped in. Some of the coups were inspired internally, some were indeed popular but in others, either the CIA, the socialists - the USSR vying for influence, or the former imperial powers (France, England, Belgium) weighed heavily. 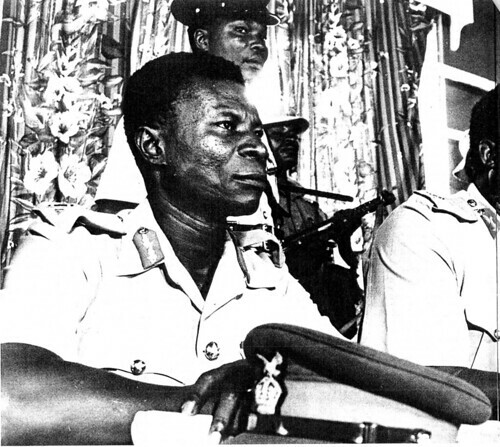 In Nigeria, the military as an institution decided that it would hold the reigns of power. In Ghana, the NLC was rather wanting to return to civilian rule but the precedent had been set and later in the 1970s and beyond, those who did step in were less benign. 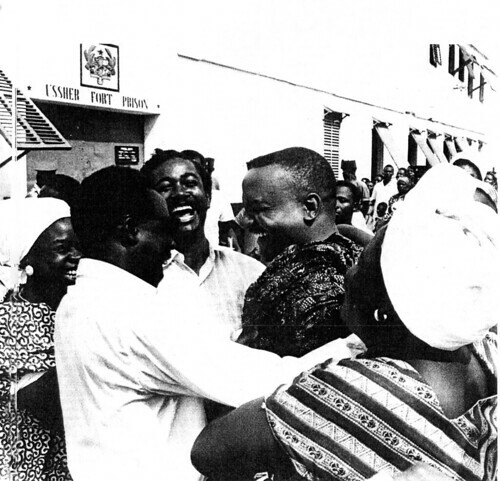 The enduring image of the year in Ghana is the sight of the political prisoners freed after the coup standing outside Ussher Fort being greeted by their families and friends. Some of the prisoners had been essentially starved to death or at best fed gari laced with sand - a quite macabre policy if you consider the already low nutritional value of gari. Well less said on that. I measure greatness based on what one does with power and on the whole African leaders have been poor in their exercise of power. What of the rest of Africa in 1966? Here perhaps the covers of the issues of the magazine might shed some light. 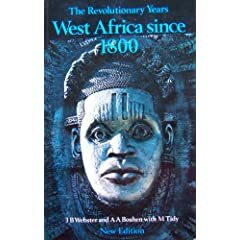 A young Alfred Adu Boahen completes Topics in West African History, perhaps the most influential history textbook on Africa and one that revealed the undoubted depth of African scholarship and accessiblitity. It featured prescient analysis of colonial rule and beyond. On his road to becoming the most influential scholar on Africa, he was busy writing the follow-up West Africa since 1800. Chinua Achebe publishes A Man of the People - a satire of corruption. Wole Soyinka publishes The Lion and the Jewel - a drama and satire of corruption. 1966 is like a crossroads and a good point to take stock of Africa as a whole. Looking forward, independence was gained but many countries didn't start their post-colonial journeys on the right footing. Lots of things could go right and in many ways, there was a lot of promise on the horizon, but you could also see traces of the problems of the next few decades. There has been progress forty years on but sometimes I wonder if we are still at the same place. Next in part 4: Chinua Achebe weighs in on the Voices Inside Things Fall Apart. See also: The Busia Papers for another perspective. Picture of Nkrumah with military brass says it all. 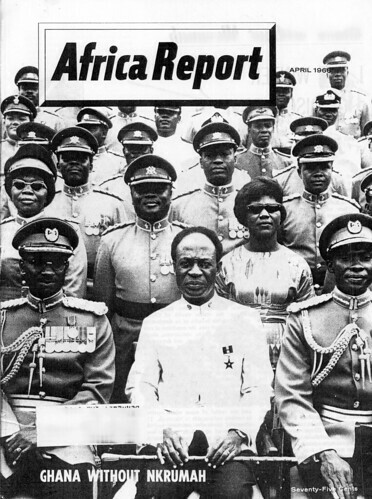 At the end, deeply alienated from significant portions of the Ghanaian populace, the economy tanking under the weight of socialist central planning nostrums, trusting in the show of force represented by military support, brandishing the mystical hokum-bunkum of the white tail, Nkrumah was an overripe fruit waiting to fall. For all who have had to leave Africa –under whatever circumstances - this may be a very inspiring poem. To Ghana our hearts and souls belong, our dreams of old and new. Your sacred grounds receiving our libations as you did our mothers and fathers. Hopes never faltering while heeding the wisdom of the ancients. While our fathers nurture our visions old and new against all odds. We pledge our commitment to a prosperous and brighter future. Lest we forget, lest we perish. "deeply alienated from significant portions of the Ghanaian populace" That is a serious fallacy. Nkrumah was a man of the people. Even JB Danquah, hailed as the doyen of Ghanaian politics, as much supported this when he said that "even if we fail you, Nkrumah won't." I know this, not just because my paternal grandfather worked with the Nkrumah regime, but also because I have in front of me the book, published by the Socialist Forum here in Ghana, entitled "The Great Deception: The Role of teh CIA and Rightwing forces in the overthrow of Nkrumah". It contains de-classified documents by the CIA, with extracts of letters wwritten by Nkrumah to the US government about his aspirations for Ghana, and by extension Pan-AFrican movement. Not only that, but documentary evidence of the same JB Danquah going to the new US ammbassador to Ghana demanding why his pay from the US government was not forthcoming!!!! I feel the heat here in Ghana, because somehow, somewhere, the acceptance by both parties that Nkrumah was a great man, with all his flaws--the Preventive Detention Act of 1958 for example was deemed a mistake, but was used in equal measure by the British over Northern Ireland in the seventies -- is coming into form. Both the NDC, and even the ruling NPP, have recently accepted that Nkrumah was a great man. Finally, I do not think that you have to be a socialist to appreciate the magnitude of social development Nkrumah brought to Ghana. SO, statements like "the economy tanking under the weight of socialist central planning nostrums, trusting in the show of force represented by military support" that amazeddad makes isn't just fallacious, it is a great disservice to the memory of not just the founding father of Ghana, but ALSO of Pan-Africanism. I must preface all this by saying that I am an amateur diplomatic historian by training, so the ideas over bias are not lost on me. To boot I challenge anyone to provide PROOF that Nkrumah can be likened to those dictators like Mobutu and Bokassa who seriously regressed Africa. Thta's my two cents, cheers!! In response to Mr. Bensah's comments on the comments I made to this blog earlier, I submitted the following to his blog. I'm copying my comments to your blog because he posts here as well. This is reasoning-lite. When I say Nkrumah had alienated "significant portions of the Ghanaian populace," your response should be the citation of a poll that refutes my assertion. Or better yet, the results of a free and fair election that was contested by any Ghanaian who met the Constitutional requirements, within a multiparty state. This latter condition couldn't have been met because your idol had foreclosed that option. Would you seriously prefer to live in a one-party state today? Saying that Nkrumah made mistakes because he was "human," and believing that that absolves him of critical judgement just opens the floodgates for each and every dictator and historical miscreant, starting, let's say, from Genghis Khan to Pol Pot to wash away their sins. Your calumny against JB Danquah should not go unanswered. I'm not an expert in the history of that period, so I throw out a challenge to anyone who is to come set the record straight. You might as well say that Nkrumah's tilt toward...what?...I'd say the senseless cult of egomaniacal personality placed him in the pay of his Soviet masters, who in the end had to provide guards to protect him from Ghanaians. Isn't that rich in irony? 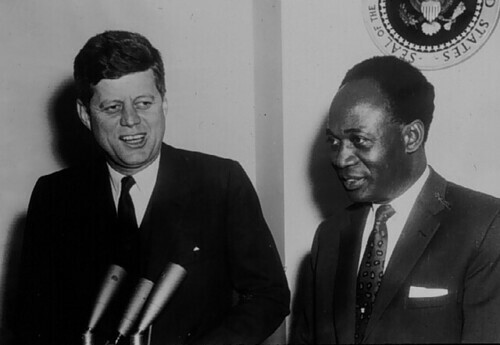 All of Nkrumah's so-called achievements do bear scrutiny, there can't be any doubt that the record is mixed. There is no question that the trajectory of the country at the time of his ouster was not a pleasant one. Having said all of this, though, I think that the sooner Ghana gets over this and seizes a true destiny away from false nostalgia the better. Lastly, I hope you don't really believe that being an intellectual with a Ph.D (of course, Nkrumah didn't even have that, I believe, what he had was a honorary degree - which really doesn't entitle one to call oneself "Dr." - and his calling himself such was the regrettable beginning of Ghana's worship of the fatted calf of the golden Ph.D idol) and a student of Theology qualifies a person to be a good head of state.